Lily Cox-Richard, Callus, 2018. View from outside the gallery. Photo: Paul Hester. Courtesy of the artist and DiverseWorks. Berm runs through Nov. 3 at DiverseWorks. In her solo exhibition Berm, on view at DiverseWorks through Nov. 3, Richmond-based sculptor Lily Cox-Richard thinks about infrastructure and public space, from the ground up. 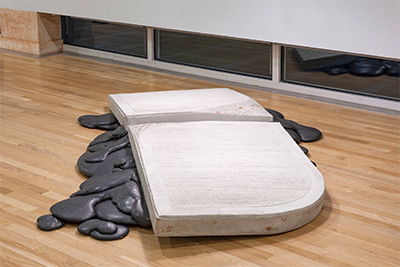 Lily Cox-Richard, Callus, 2018, fiber-reinforced concrete, urethane foam, pigment, 11 x 63 x 91 inches. Photo: Paul Hester. Courtesy of the artist and DiverseWorks. Berm takes place within the lower eighteen inches of the DiverseWorks gallery at MATCH, engaging with the gallery floor, interacting with the building’s ground-level windows, and incorporating the breezeway and brick walkway outside. One work consists of a low-to-the-ground mud stain along the gallery’s wall, an evocative image in a city marked so recently by a major hurricane. “I wanted to get low, to have the space sink down,” Cox-Richard says. “That site is an active space but also potentially hazardous (especially in Houston). It’s prone to flooding, to rot, mold. It’s the area you bolster things up and out of to keep them safe.” Instead of lifting things out of that space, Cox-Richard looks down, digging into the lowness of it, and inviting the viewer to join her at floor-level. Lily Cox-Richard: Berm, 2018. Exhibition installation at DiverseWorks. Photo: Paul Hester. Courtesy of the artist and DiverseWorks. 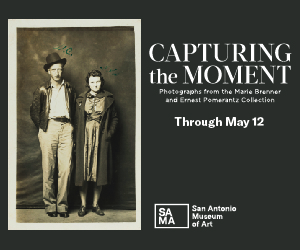 An important part of the exhibition is the way in which it activates the viewer’s body with this downward gaze, moving her inside and outside the building, breaking past the boundaries of the walls. One of the best sites for seeing the exhibition might be from the ground outside the MATCH building, where viewers can roll on a “low-profile creeper” (a kind of movable, ground-level dolly). Periscopes allow viewers another perspective, framing particular ways of seeing the sculptures from outside. By looking from another vantage point, Cox-Richard hopes to open a conversation that is at once about the body’s place and about politics. In a broader cultural context, what does it mean to take a knee and see something previously unseen? How does vulnerability figure into the viewer’s experience of a museum? One of the more subtle works in the exhibition is not a sculpture at all: Cox-Richard has insisted on changing the gallery’s hours, opening it from 12-8 pm Thursday through Saturday, and opening the street-facing door to invite more interaction from Midtown’s passersby. Working from the ground is not only a material challenge, but a political one; it is not only a gesture of opening new physical spaces, but of also inviting new conversations and questioning the accessibility of the institution itself. By making the building a central element of the exhibition’s conceptual premise, Cox-Richard asks who art’s public includes, who is allowed in, and how the terms of engagement might change when we shift perspectives. Courtesy of the artist and DiverseWorks. If a berm is a kind of barrier dividing two things–in military terms it can be a defense or fortification, and in gardening or industrial contexts it is a raised border that separates two spaces–Cox-Richard points toward ways of breaking down the divisions between outside and inside, gallery and public, discarded materials and public space. She points to the systems embedded into our ways of thinking that often cause divisions between communities, viewerships, and public spaces. 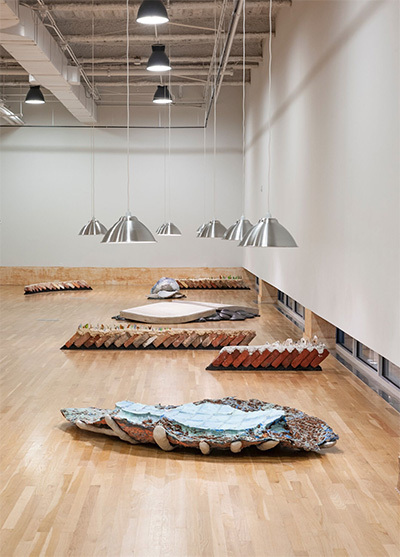 Embedded systems are referenced both in her institutional critique and in the materials with which she works: the sculpture Woundwood (2018), for example, is a raft-like form with an impression taken from one of Houston’s iconic Live Oak trees. A large cavity in the tree’s trunk has been filled with concrete, filling the hole with a material not natural to it. Another two sculptures, made during Cox-Richard’s residency at Artpace, are built of materials she collected at dumps and recycling centers. 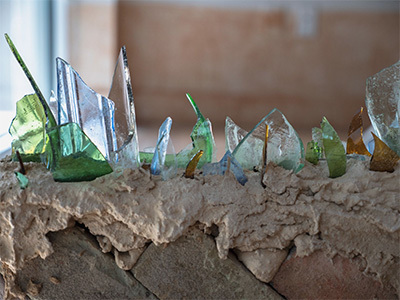 “These were sculptures to dig into debris and aggregate,” she says, “finding elements inside them and recrystallizing them.” We can read history, she insists, from found materials; we can rethink embedded systems of knowledge by juxtaposing these materials with their natural surroundings. 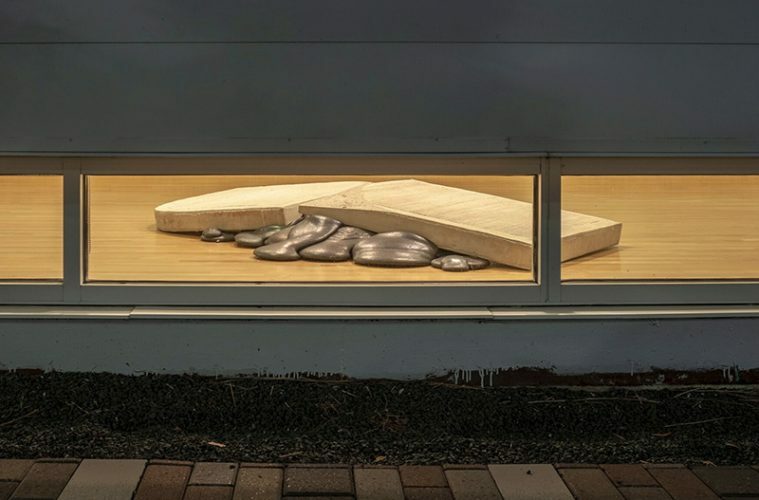 The sculpture Callus (2018) is formed from pieces of sidewalk that float on iridescent black puddling material, ground down to reveal itself as aggregate. These layers of material mimic the built-up layers of tissue that cause a callus on one’s skin. In the case of skin, a callus is formed by repetitive work and recurring friction, but it also gives the body a kind of accumulated potential for resistance. Here things are not only ground down, but also layered up to see what they might build. It’s a simple sculptural premise, but one layered with political potential.